Car maintenance doesn’t just end with auto detailing. There’s also a process called auto rustproofing that is equally as important. Sure, interior detailing keeps your car clean and hygienic while exterior detailing is excellent paint protection. But if you want to keep your ride from getting rusty and ugly, rust protection is a must-do as well! There are so many things you need to know to make the most out of rustproofing services. For example, why do you even need to protect your auto from salt and corrosion? Is there really a difference between rustproofing and undercoating? What kind of product should you use to prevent rust? All those questions and more will be answered here! Where to get your car rust proofed? How much rust proofing costs? Discover why rustproofing is a service you need to keep your car running for a longer time. Then, share it with your friends! Rust proofing your whole car and underbody is a must! When you’re talking about car care, it’s not just the paint you have to be worried about. Rust is an enemy that you won’t be able to escape from. From the moment you drive your car out of the dealership, rust is all but forming. That’s because it doesn’t take much to make rust. All you need is for water, oxygen, and iron to react and boom! Iron oxide (or informally called as rust) is formed. Good thing auto companies have done a lot of researching throughout the years to formulate a solution that protects against corrosion and the damages it can do. Total car protection products like rust inhibitors and rust converters are made up of quality chemicals that can give your ride maximum protection from corrosion and kill rust and keep it performing amazingly well for a longer period of time. You can even choose from different brands and buying the product can be easily done through an online store like the Amazon and Autozone. So, whether you are rust proofing car underbody or exterior or even any metal tools, you can find the products which will fit your specific needs the best there. Or, if you prefer to leave it to the pros, brands like the Rust Check can help you to rust proof your vehicles at a reasonable fee. Where can I get my car rust proofed? Is rust proofing for new cars necessary? How to prevent rust on underside of the car? What is electronic rust proofing? Proofing your car can prevent future rust from forming again. Like detailing, car rust prevention products offer great structural protection to your vehicles. If you want something that prevents rust from forming and can guard against further damage, reading a few rust proofing reviews of recommended products is an excellent place to start. Car undercoating reviews are another type to look into to determine which the best oil to use for undercoating is. 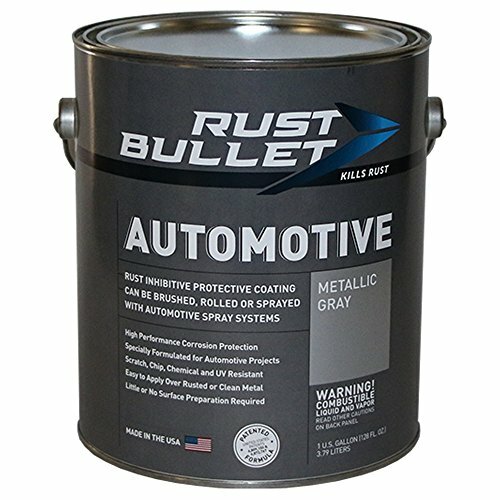 If convenience is what you’re after, this rust inhibitor paint by Rust Bullet is the one you need. It’s a high performing product that protects your ride from the unwanted effects of corrosion. It has a unique one-step process that can easily do the job of two auto products! So what if rust is already forming on your car? With this Rust Bullet inhibitor, you can just apply over it to stop it from causing any further damage. Plus, this is a permanent seal! No need to keep re-applying every so often. It also works with clean metal and you wouldn’t even need to do any surface preparation before application. See, super convenient! Plus, it’s scratch-resistant and it doesn’t chip easily so you know you’re getting your money’s worth. You’re also getting added protection for your auto since it’s also UV-resistant and chemical-resistant. Add that to the fact that you can apply it any way you want; be that by brush, roll, or spray and this might just be a clear winner already! Don’t think that this remarkable inhibitor is only for automotive use. Its heavy-duty formulation makes it a great choice for your industrial and marine business as well as for your household and farm machines. Another excellent rust proofing product you need to try is this converter from FDC. It doubles as a surface conditioner and primer that transforms rust to a protective coating made out of polymer. If you weren’t lucky enough to stop rust from forming, it’s okay! This product actually needs that rust to work. By converting iron oxide into a polymeric barrier, this product helps eliminate existing rust, prevent further rust formation, and keeps your car very well protected. Not only that but it seals out moisture and is an excellent primer for oil-based paints. Plus, you don’t need to do any surface preparation. So say goodbye to sandblasting, grinding, and scraping! This product is also fast with its first coat drying in 20 minutes. But if you want the best results, remember to add another coat on top of it. Let it cure for about 48 hours and seal it with a high-quality oil-based paint. Once you buy it from the store, it’s ready to use. No need for thinning, just shake or stir. You can even apply it with either a brush, a roll, or a spray. Just remember to wash all application equipment after use quickly. If you want guaranteed maximum protection, then Fluid Film should be the brand of your choice. 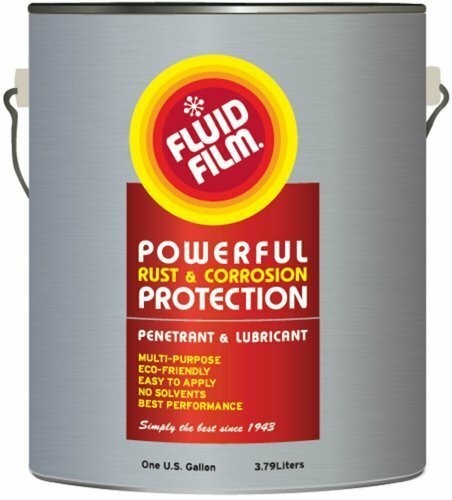 This rust preventive lubricant has lots of purposes you could use it for so you know you’ll be getting a really great deal. Plus, you don’t need to feel guilty making use of this product because it’s environment-friendly! Its thixotropic formulation is created with wool-wax, refined petroleum oils, and other special agents. These ingredients aid in controlling the rate of corrosion happening to your auto. Corrosion can be slowed down by penetrating the metal base of hard to reach areas of your undercarriage. With this, your ride will be protected all over! It’s also solvent-free so you know it won’t dry out fast. Its non-toxic and non-hazardous properties are good news for health making it super safe to use. This excellent product can be used in a lot of other equipment as well. Use it on your truck or lawn mower. You can even use it on your snow blower chutes because of its anti-freezing agent. It comes in different sizes so you can get the one that fits perfectly with your needs. From a small 11.05 ounce bottle to a 5-gallon bucket, Fluid Film has got you covered for sure. When you’re buying from 3M, you know it is high quality. They’re not a well-known brand for anything less than excellent! If you want to do a professional quality job without having to go to your local auto shop, the rubberized undercoating from 3M might just be what you’re looking for. The rubberized undercoating formula of this 3M product creates a very durable protective barrier that not only seals out moisture but also pesky grit and grime that the road throws under your car. Without the black protective coating, this product creates, little road debris would increase the rate of corrosion. Not only does it give amazing, long-lasting protection to your undercarriage, but you can also even use it on other parts of your car like wheel wells, door skins, floor pans, and even the underside of your hood and trunk lid. It even protects from abrasion (and not just corrosion!). Now, what’s all-around maximum protection! But it does more. This rubberized undercoating also has noise deadening properties that allow you to enjoy a smoother quieter ride. It has an excellent no-run formula so applying it will be quick, easy, and clean. Definitely use this for your cars, trucks, and other vehicles! There are some instances where rust has already formulate before you can do some proofing. But don’t worry, rustproofing car parts even then is now easy. 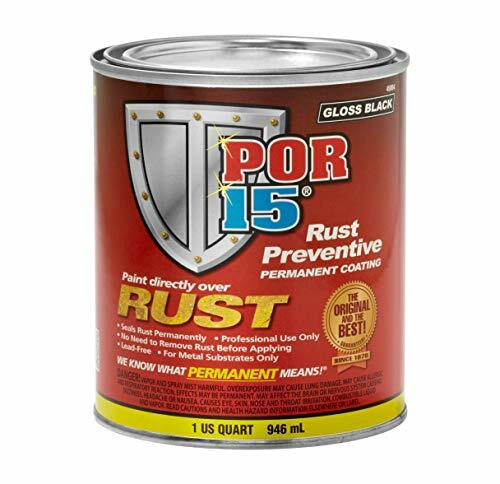 You can use this POR-15 Preventive Permanent Coating even with the rust intact. You can seal it permanently and still shield your ride from further damage. This is like rust proof paint for cars since you can have the shine and gloss you want plus the repairs and prevention you need. That’s smart automotive detailing! Sometimes you just can’t get there faster than rust. It’s a pesky problem that will always come back to haunt you at some point in time. Good thing products that deal with this specific problem already exist! If your car is already sporting a few rusty places, don’t worry! The POR-15 Rust Preventive Paint can be applied even with the rust still on the surface. Yes, that’s right. You don’t need to do any surface preparation like sandblasting and scraping. Just apply the product directly to the rusty metal. You’re not just covering the rust from the naked eye; you’ll be sealing it permanently and shielding your car from further damage done by corrosion. You can get a fantastic finish plus the added benefits of repairs and rust prevention with just one product. Just remember that this paint does contain a few chemicals that may be harmful if you get overexposed. So proper respiratory gear, glove, protective glass and very good ventilation are needed when you’re doing an application. Aside from the amazingly easy application of this product, Rust-oleum’s Rust Reformer features a water-based formulation that transforms rust into a paintable surface. So, it’s a rust converter if you want to speak technically. It uses the rust that has already formed on your car’s metal and creates a flat black shield that helps protect it from developing further rust. You don’t need to do any preparation like sanding since it makes use of iron oxide anyway. It also does a quick job of drying. You can already touch the surface after just 20 to 40 minutes! But it’s still best to let it cure at least 24 hours before applying paint and an oil-based top coat on it. If there’s a rustproof paint, then a rustproof primer isn’t way behind! So you want an awesome color that doesn’t come in any of those awesome rustproof paint products in the market today. Does that mean you need to compromise and let go of the dream? No! 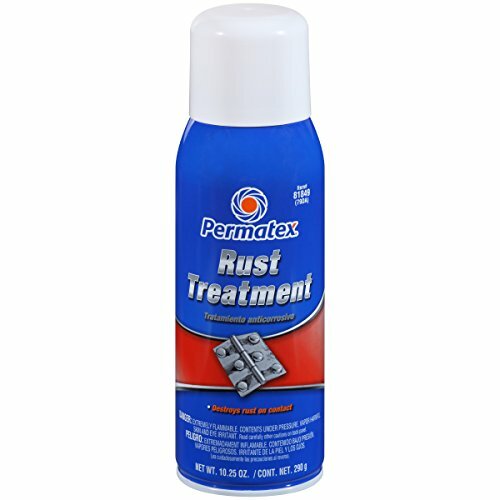 With Permatex’s Rust Treatment, you can still choose any color you want and get the maximum rust protection you need! It does the job of a rust protection product really well by destroying rust that has already formed on your auto’s metal surfaces. It can even reach those pesky hard to get places because of its convenient spray form. It’s an added benefit that the defensive shield it creates is made with a black polymer that you can definitely paint over! Its advanced formula can also be used for fiberglass and body fillers. You can even use this product on trucks, trailers, and other vehicles. You can even use it on your fences and decks if you want to. Here’s another rust converter worth trying out. This one from Gempler’s chemically converts rust into a static, black defensive shield. It also works great as a rustproof primer. Its dark grey color is paintable so whatever color you want, just apply it on top and you’re good to go. This product’s highly convenient spray formula makes it a great choice if you want to reach those little nooks and crannies on your vehicle. It’s also an ideal product to use for smaller projects. You don’t need to do any preparation as well, like grinding and scraping. So that’s one step less for you! If you want it to last long, remember to let the product cure for about 48 hours and to put an oil-based paint on top of it. A word of caution, this product is not heat resistant. If you want something to put on your engines or high-temperature equipment, this one from Gempler’s might not be the best fit for that. If you want to do your rustproofing and undercoating all on your own, go for it! You will definitely need to buy the right tools for the job and not just the right products. One of the equipment you’ll be needing is a spray gun to make applying your undercoating easier. A spray gun allows for a more precise application which is something you’d want if you’re targeting harder to reach areas. 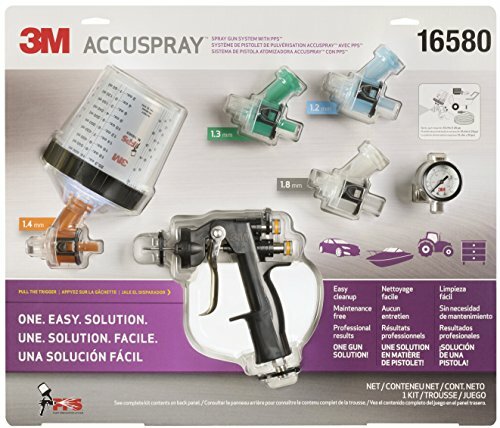 Some automotive brands create their own spray guns and sell them with their products like Fluid Film and the 3M Accuspray. You can easily buy spray guns at hardware stores and online like Amazon. While shopping, you should definitely check out brands like Astro, Custom Shop, and TCP as well. When it comes to rustproofing services, undercoating is a vital process that you should always get if you want to extend the life of your auto. Remember that it’s not only road debris that’s hitting the underside of your car. Chemicals like magnesium chloride are used on the road so those are sticking to your underbody as well. Now that you know what rustproofing is and where to get your rustproofing services, the next logical question to ask is: how much does rustproofing and underbody coating cost? To be perfectly honest, rustproofing and undercoating can be a pricey but if you want to be safe, having a trained professional apply it might be better for you and your car in the long run. To give you an estimate of the amount you might need to shell out, a regular rust proofing service will cost you about $125 to $200. Availing packages that include other auto services, like undercoating, can go up to about $400 to $500. When it comes to getting rustproofing and undercoating services, you might want to check out some of the leading companies from the global industry. With them, you know that they only use first-rate chemicals formulated by only the very best professionals in the field. If you want products and services that are 100% reliable and high quality, then you might want to turn to the experts in the industry. Ziebart International Corporation was one of the very first companies that introduced rust proofing in the auto world. You don’t even need to live in the US to benefit from their top-notch service! You can avail of their rust protection services at any of their 950 undercoating locations in over 33 countries. If you go with Ziebart, rustproofing will cost you about $120-$140 initially, depending on your car and its condition. Now, giving the best rust proofing service isn’t just about using the highest quality of products. It’s also about ensuring that your customers are satisfied and happy with you and your service. If you want a company that keeps customer service on top of its priority list, Krown would be your best bet. You know you’re only getting the very best and most advanced technology available! Their environment-friendly stance is backed up by the fact that their products contain no solvents, no toxins, and no volatile organic compounds. You can avail of their top-notch rust proofing services at any of their 250 locations in Canada, Europe, and the United States. If you go with Krown, rustproofing will cost you $130-$150 initially, depending on your car and its condition. An important thing you need to know about general auto rustproofing practices is the difference between actual rust proofing and undercoating. Most people think that they do the same thing. While they both protect your car from the damages done by rust and corrosion, both services do so by targeting different auto parts. What you need to understand is that rust accumulates in all sorts of places, and you really can’t choose where it pops up. Some parts of your car are reachable so they’re more easily protected. But there are still many spots that are harder to reach but must still be defended from rust. Rust proofing is the solution to this problem! It specifically targets hard to reach places all around and inside your car that rust can easily form in. This is done by spraying a kind of protective wax all over these parts. Most vehicles nowadays are already equipped with some kind of undercoating when you first buy it from your dealer. But it won’t last you very long. After a year, it’s a good idea to remove your old undercoating and apply a new one. Undercoating is done by applying a protective layer to the undercarriage of your vehicle. This is an essential step. While the underbody cannot be visibly seen while you’re out driving, it is highly exposed to various elements like mud, dirt, and debris; and it is very susceptible to damage. Applying undercoating helps keep these pollutants away from your car’s important part and will give you maximum protection from rust. Read this article to learn more about rust proofing and undercoating. There are many kinds of rustproofing products you could use to protect your car from the damaging effects of corrosion. One of these products is a rust inhibitor. You now know that stopping rust formation is not completely avoidable. But a rust inhibitor can help slow it down. Inhibitors are formulated to slow down a metal’s oxidation process when it becomes exposed to water and oxygen. While it doesn’t stop rust from forming, inhibitors help slow them down so that you can search for a more permanent option. This product shouldn’t be confused for a rust remover. 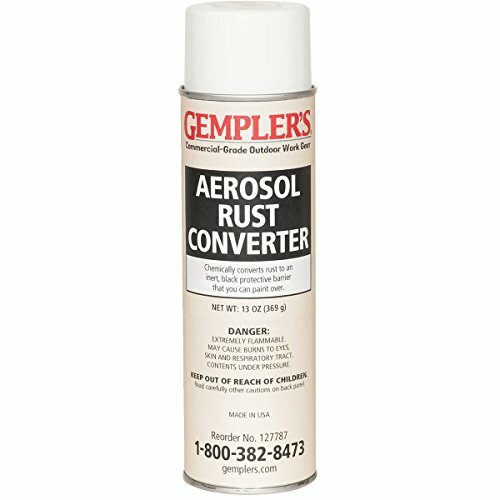 If you already have rust on your surface, look for another product like the rust converter. This isn’t what you need. Since corrosion is a recurring problem many faces, companies all over the world (and not just automotive ones!) have created different corrosion inhibitors that can help you depending on what you need it for. Read this article to learn more about rust inhibitor for cars. One of the brands you need to check out when buying rust proofing products is Rust Check. It’s a well-known brand that gives it loyal customers only the highest quality products they deserve. In fact, they even won the 1997 Consumer Choice Award for Rust Proofing Services. Rust Check is known for its oil-based product of the same name. It has active corrosion inhibitors that get rid of moisture, preventing rust from forming. It works like a sealant against rust. Plus, they have a lifetime renewable warranty as long as you use Rust Check on your car’s underbody every year. Read this article learn more about the Rusk Check company and how they can help your car to guard against rust! Another type of rustproofing product you need to know about is a rust converter. A rust converter is a primer that is made up of tannic acid and an organic polymer. It can turn iron oxide (that’s rust!) into iron tannate when directly applied to it. Iron tannate is a black, matte composition that is more stable than rust. While all three products have the same primary goal (which is to get rid of rust), all three do so differently. Like car wax and car polish on car’s paint, these three products have specific functions that can individually help your vehicle gain the protection it deserves. A rust encapsulator works best with light to medium rust formation and can be used on any type of metal surface. It prevents rust from spreading to other parts. A rust remover only takes off the rust that’s already formed on the metal. 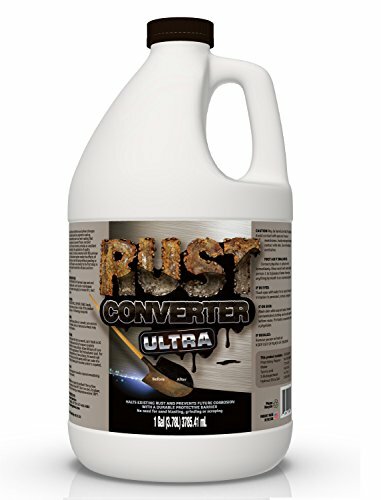 A rust converter, on the other hand, works best with medium to heavy rust formation and uses rust to create the protective barrier that’s resistant to moisture. Read this article to learn more about the rust converter. During the snowy winters, road salt is used to lower the melting point of snow and make it disappear faster on the roads. While it’s not as environmentally-friendly as people like, it does help cars move safer during this cold and dangerous time. Unfortunately, it isn’t the friendliest solution for your ride. Melting water isn’t the only thing it speeds up. It also increases the oxidation process of metal. You know what that means: corrosion. Yes, corrosion means faster rust formation which in turn means that the aesthetics of your awesome auto will be ruined. But aside from its flawless finish, corrosion can eat up the metal of your car and you’d be forced to get rid of your ride faster. Well, good news for you! There are many ways to get rid of road salt from your vehicle’s surface and undercarriage. A simple hand washes and using a snow foam will do wonders during the winter. But you can also make use of coatings and protective paint films. Read this article learn how you can shield your vehicles from corrosion due to salt. Now that you know more about the services, another question to ask is: is there a shop that provides rust proofing near me? Auto shops aren’t really sparse usually so you can always drive around to search for one. You can call on friends and ask where they get their services done. You can also just pick up your phone and search online. By doing so, you can also look at the reviews that other customers have about the place. If you don’t want the extra worry about how effective their service is, you can always look for the more popular companies like Krown and Ziebart, and have your services done there. While it is true that models that are made after 2006 are made up of galvanized steel that is then coated with zinc, this only makes rust formation less likely. “Less likely” isn’t going to cut it when you want only the best for your ride. Sometimes, even zinc can get chipped off and you’ll be leaving your undercarriage exposed to the elements. That’s why you still need rustproofing and undercoating even with newer models. Some might argue that you don’t need rust proofing for car models after 2006. The reason for this is that most parts of your undercarriage are made of galvanized steel coated with zinc. Zinc does not react to oxygen so rust formation is less likely. There are numerous ways to prevent rust from forming on any part of your car. The best way to do so is to prevent it from ever happening in the first place. Applying a protective coating on spots that rust most easily forms can ensure you that you won’t need to think about rust for another year. Another good way to prevent it from happening is to wash your car regularly. That means doing the underside as well. While you’re at it check for rusting in the places you don’t usually see. There are times when rust just gets the better of you, and it forms. When this happens, don’t worry. A little sandpapering here, primer and painting there, and a bit of rust protection product there as well, and you’ll be able to get rid of that pesky rust. One service that’s been gaining attention recently is electronic rust proofing. Some auto dealers out there will try to sell you this service as an add-on when you’re buying a new ride. They’ll tell you how superior this is to regular rust proofing, and they’ll be very convincing about it. But don’t fall for it. Electronic rust proofing is done through a process called cathodic protection which forces a flow of electrons to wrap around the surface of the metal. The protecting part is done when a complete electrical circuit happens. Unfortunately, this process doesn’t work on the ground so your ride won’t be getting any of the benefits. Unless you want to park it under the pool, that is! If you’re going to rustproof a vehicle that’s made for water, then by all means, use electronic rust proofing. It can do the job better than regular rust proofing can. But, for your car, it might be better to stick with the classic. An annual overall wash and oil spray provided by a trained professional is still better and a more effective form of protection than an electronic rust module. Plus, you also get manufacturer warranty against corrosion. While rust modules seem like the more convenient option, they don’t work as effectively as the time-proven sprays. It might be better resign yourself to the fact that you’ll be making an annual trip to an auto shop if you want your car to perform better and last longer. When it comes to undercoating, there are still many types of spray you would encounter. Two of those would be the drip spray and dripless oil spray. Rust proofing your vehicle with either one has its pros and cons. A drip spray is the one you would hear about the most because it is a more common service done. Its formulation allows it to fully cover your undercarriage, even the hard to get places. If you’re looking for maximum protection, this is an excellent choice to get. However, it dries slower and will drip on your driveway for about two days causing stains. A dripless oil spray has a formula that creates a moisture seal and can protect your more interior parts better. It doesn’t leave stains because it doesn’t drip. However, it’s high viscosity property means that there are some nooks and crannies that it wouldn’t be able to reach, leaving them unprotected. What Is the Difference Between Undercoating and Rustproofing, And How Much Does A Car Undercoating Cost? Why Road Salt Causes Corrosion and How You Can Stop It from Rusting Your Vehicles?